Perhaps you are still in doubts regarding several breeds you like, and you’re not sure why you should choose a Dalmatian dog. The first step is to determine the purpose you want to buy a dog for. 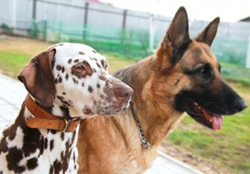 Some dog breeds have very specific characteristics and are being bred for a certain purpose. Think for instance of Huskies, who are excellent dogs for pulling a sled in very cold weather conditions. Or a Malinois, who is often used as a police dog and can be trained for that purpose very well. A Labrador is going to want to jump into every puddle of water he sees, because he is originally bred to pick up shot water birds for the hunter. But what are the specific characteristics of a Dalmatian, and do these match with the purpose you want to have a dog for? A Dalmatian distinguishes itself from other dogs through its intelligence. This gives them something human. They are however pretty stubborn and you will have to be consistent and persistent in the upbringing of these dogs. In the history of this breed, you can read that the Dalmatian, or Dalmatian dog, was used in earlier times as the companion of horse carriages. They therefore have a great endurance. Walking these dogs for hours, or bringing them along when bike- or horse riding, is no problem for them. This excellent endurance makes the Dalmatian therefore a very suitable dog to do several dog sports with, such as triathlon, flyball or agility. The Dalmatian is not very suitable for guarding. Female dogs are usually more vigilant than male dogs, but they are too fond of people and sociability to excel as a guarder of the yard. Dalmatians are absolutely sociable dogs and not suitable to leave home alone for entire days. A Dalmatian is unsuitable for keeping it outside in a kennel. A Dalmatian is definitely not a nervous, busy dog, but owners do need to be consistent when he’s a puppy, and need to raise him with enough rest. Otherwise he could degenerate into a busy dog. A Dalmatian is actually not a particularly good hunting dog. Of course there are dogs that want to chase a cat or a rabbit. Especially if they get the chance to, and if this behaviour is not discouraged when they are puppies. You can take a nice walk in the woods with your dog without any problems, if you raised your dog properly! A Dalmatian is a true children’s friend. Always enthusiastic and always in for playing. He is not very suitable for small children and babies. But this is the case for most dog breeds. A child has to be taught to deal with a dog in the right way, so that the dog understands that the child is above him in his family pack. Finally: a Dalmatian can smile! This characteristic and their funny spotted pattern make them really unique!